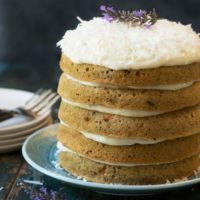 Gluten free carrot cake with cream cheese frosting nestled between each layer is a delicious dessert that’s hard to resist! 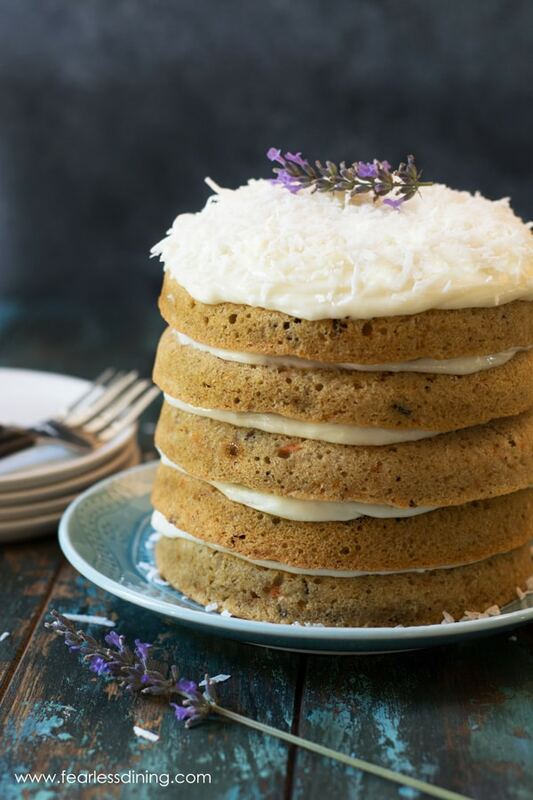 If you love carrot cake, this delicious gluten free carrot cake recipe is for you. It was quite the birthday weekend for Mr. Fearless Dining. Our friend party was a fun night of celebration. We introduced new friends with old friends, and it was a great night. The next day was the big family party where we enjoyed this amazingly moist gluten free carrot cake with cream cheese frosting. 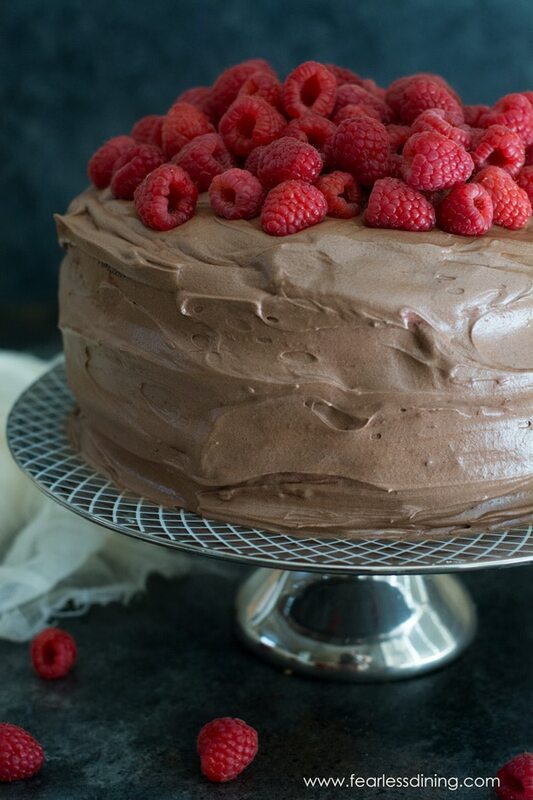 (Just in case you were wondering what the other birthday cake was, I made this delicious gluten free chocolate raspberry layer cake for the friend party!) This is by far the best carrot cake recipe I have made! I am digressing from this gluten free carrot cake recipe. 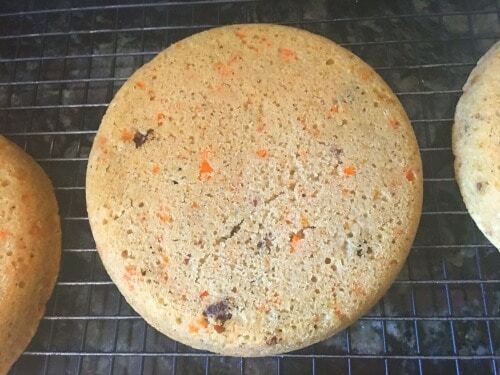 Not only does this make a tasty gluten free carrot cake, but you can also use the batter to make gluten free carrot muffins, carrot cake cupcakes, or even a carrot cake loaf. You can even get creative and add some chopped nuts :-). If you really want something good, these Gluten Free Carrot Cake Iced Cookies are fun to make! Have I convinced you to make this gluten free carrot cake recipe yet? One thing that is a little misleading is the size of the cake. Believe it or not, this gluten free layer cake is small. 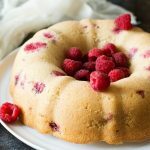 I used these tiny layer cake pans to make this cake. This cake can feed 6-8 people, depending on how much they love cake. I will also say I didn’t put the cream cheese frosting on the sides of this cake. Mr. Fearless Dining is trying to watch his calories, so I wanted to honor his wish for his birthday. The cake sat most of the day in the refrigerator, and it did not dry out at all. This gluten free birthday cake stayed moist and delicious. *Note, you can easily make this gluten free carrot cake dairy free too. Just use a dairy free butter substitute and dairy free cream cheese, like the one by Daiya, for the frosting. The carrot cake itself is dairy free, since I use coconut oil instead of butter. One reason this cake stayed moist is that it has almond flour in the recipe. Almond flour holds in moisture in gluten free baking. If you are allergic to nuts, you can skip adding almond flour and just substitute in a little more gluten free flour blend. Happy Birthday Mr. Fearless Dining! 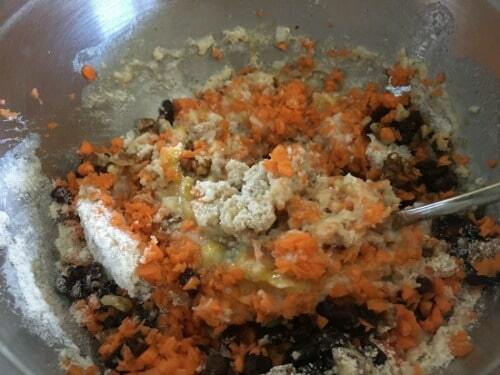 Add the wet and dry carrot cake ingredients in a bowl. Mix together. Cake Batter Tip: Don’t overmix the cake batter. The cake will be lighter if you just mix it enough to blend the ingredients! Tip the baked cake layers onto a cooling rack so they can cool off. Cake Frosting Tip: Make sure the baked layers are completely cooled before you add frosting and assemble the gluten free carrot cake. If the cake is at all warm, it will melt the cream cheese frosting, making your layers slide around and possibly tip over! Whip up your cream cheese frosting. 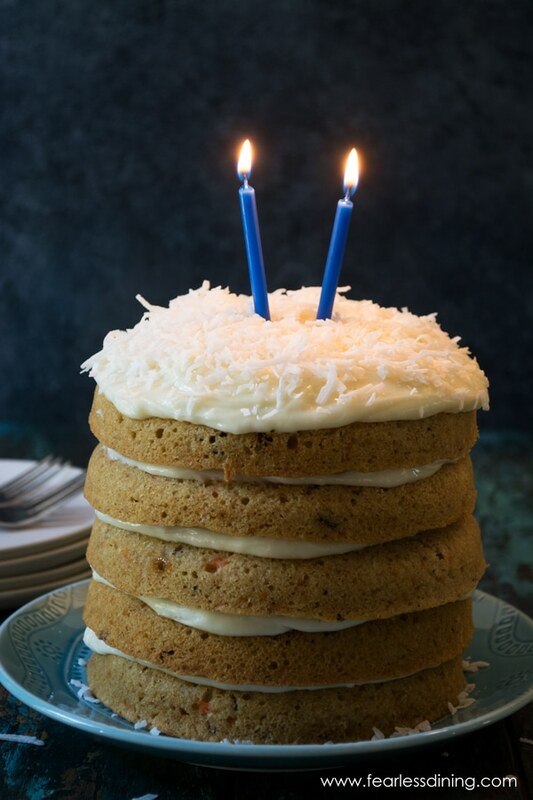 I topped this gluten free birthday cake with coconut too, but feel free to skip the coconut if you don’t want it. If you want to try to make a fancy Carrot Cake Roll, you will want to check out this Gluten Free Carrot Cake Roll (aka Log Cake) recipe! 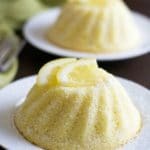 If you don’t want to make a multi-tiered layer cake, you can make this in a regular rectangular cake pan, or even a bundt cake pan. 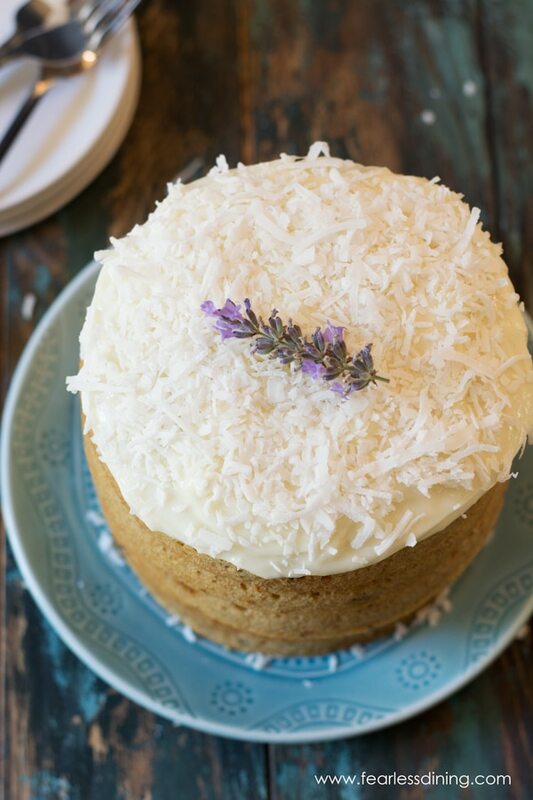 An easy gluten free carrot cake recipe with a dairy free option. Preheat the oven to 350 degrees. Spray the cake pan with coconut oil to prevent sticking. Shred washed and peeled carrots. 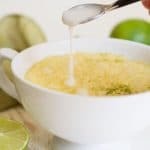 Add all dry ingredients to a large bowl and whisk to blend. Add wet ingredients and shredded carrots to a medium bowl and mix well. Add raisins and nuts, mix. Pour the wet ingredients into the dry ingredients and mix. Don't overmix the batter. Bake the cake in the oven. When the cake layers are finished. Let them cool on a cooling rack. 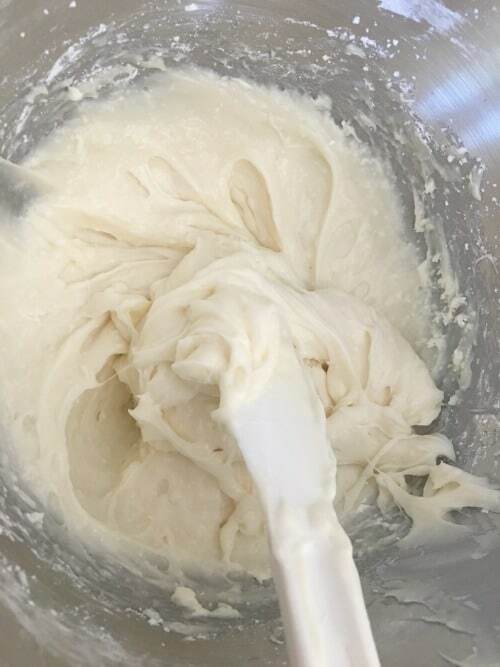 Add the frosting ingredients to a mixer (except the coconut) and mix until thick and creamy. I hope you like it as much as our family did :-). Oh, my husband’s favorite carrot cake. I bookmarked this for reference, gonna try this recipe for him this weekend. That carrot cake looks absolutely wonderful! What a pretty cake! You are such a good gluten free baker. That is so sweet Ginny. Thank you :-).